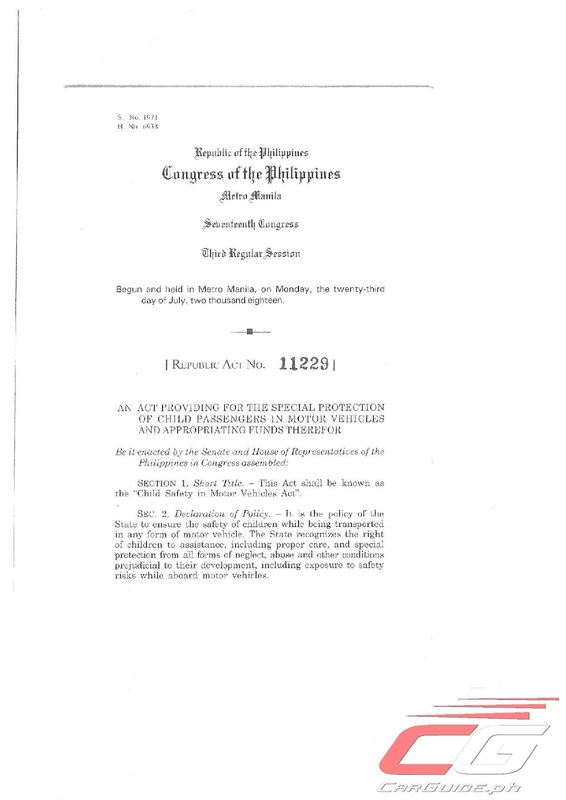 Last February 22, 2019, President Rodrigo Duterte signed Republic Act 11229 or “An Act Providing for the Special Protection of Child Passengers in Motor Vehicles and Appropriating Funds Thereof.” You can check the signed copy of the law below, but it’s worth noting that it’s fairly close to the bicameral version of the bill passed last December 2018. 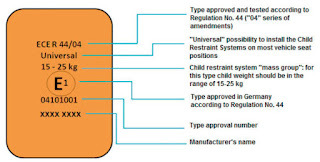 It’s unlawful for motor vehicle drivers (except for tricycles and motorcycles) to not secure a child (a person aged 12 or below) in a Child Restraint System that must be appropriate to the child’s age, height, and weight. Currently, Republic Act 11229 cites the United Nations Regulation No. 44 and No. 129. UN Regulation No. 44 classifies CRSes into 5 groups, based on weight (see chart below). In comparison, UN Regulation No. 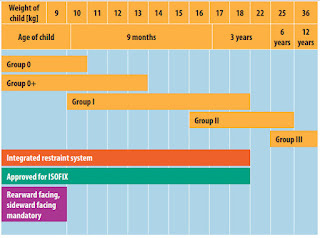 129 does away with weight group categorizations and simplifies the rule as any child under the age of 15 months must be transported in rearward facing systems (see chart below). This is to provide better protection against a child’s developing neck and head. Except when the child has medical emergencies and/or developmental conditions, or similar situations prescribed by the Implementing Rules and Regulations (IRR). 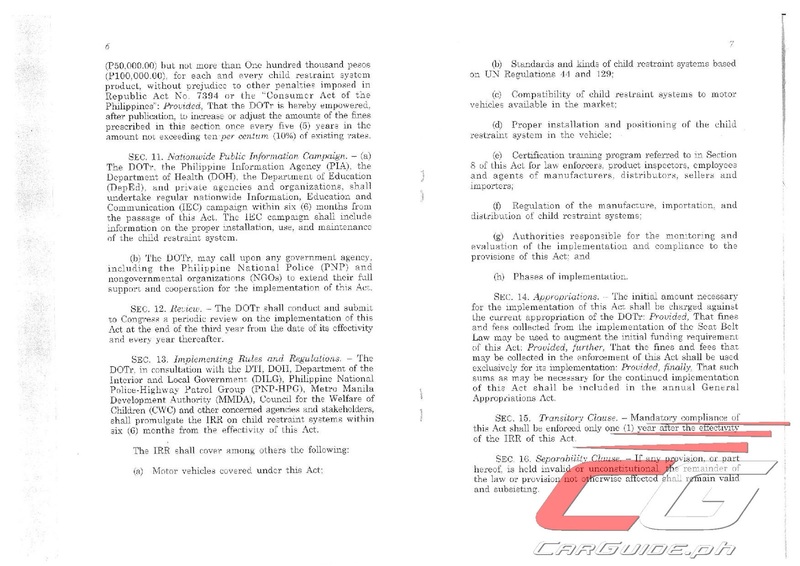 The Act does cover both Private and Public Vehicles (except motorcycles and tricycles), but the DOTr will conduct a study and within one year recommend the use of CRSes in public vehicles such as jeepneys, buses, taxies, vans, TNVses, and the like. 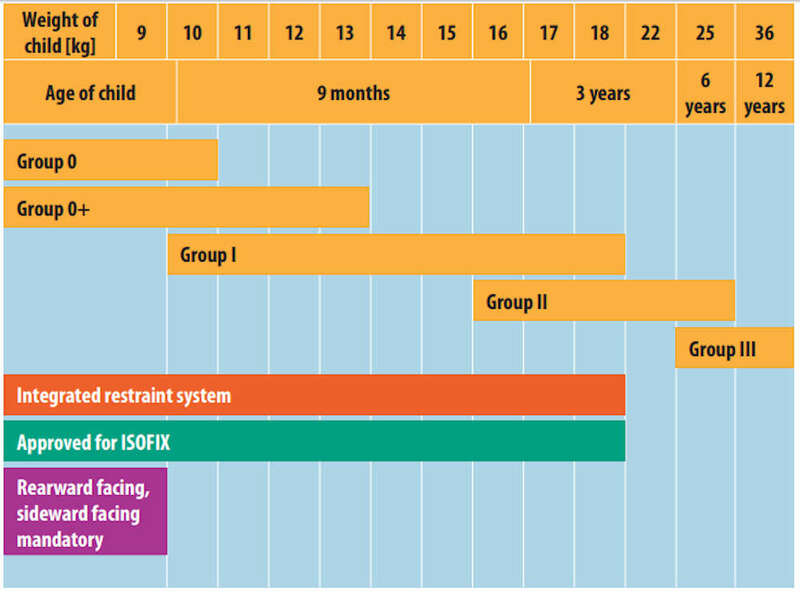 This is whether or not the child is secured by a CRS. 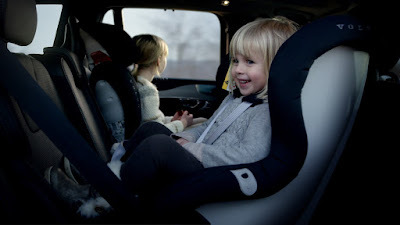 For as long as the vehicle’s engine is running and/or the child is being transported in any road (public or private). All manufacturers, distributors, and sellers of CRSes must secure from the Bureau of Product Standards (BPS) a Philippine Standards (PS) mark or Important Clearance Certificate (ICC) prior to their sale and distribution locally. 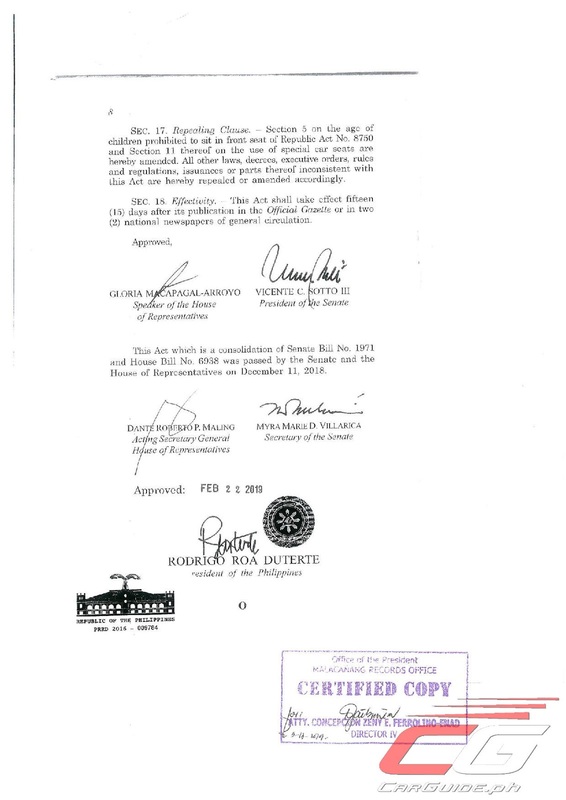 The BPS, in turn, will periodically issue a list of approved CRSes. 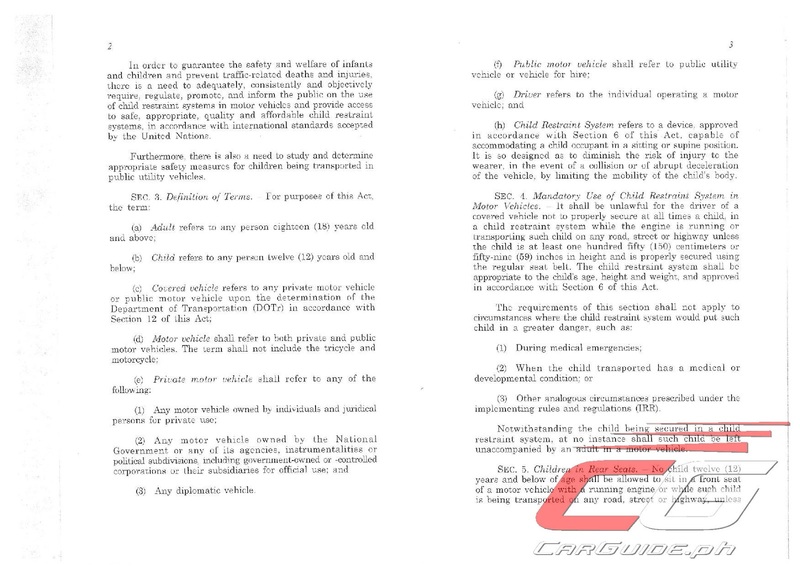 CRSes acquired prior to the effectivity of this Act shall be allowed provided that the device isn’t expired (yes, Child Restraint Systems do have an expiry and that’s indicated by a sticker at the back). 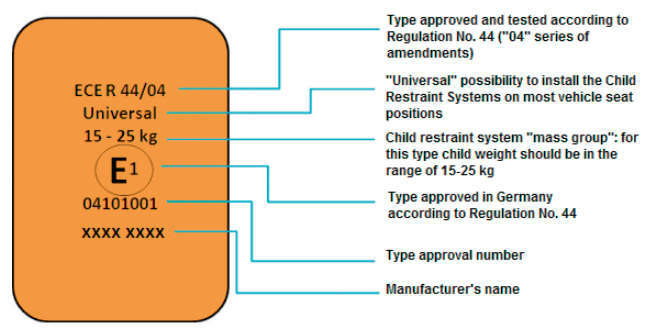 Any Child Restraint System approved according to UN Regulation No. 44 or No. 129 will come with these kinds of markings. Based on a study done by the World Health Organization (WHO) in 2016, there are at least 71 models Child Restraint Systems available in the country from 7 brands, all of which have a local distributor. Furthermore, there are 80 models from 36 brands if online sellers are to be counted. The price? They can go as low as P 1,299.75 for rear-facing only models and up to P 2,968.28 for rear-facing/front-facing combination seats, the study says. The Department of Transport (DOTr) will consult with the DTI, DOH, DILG, PNP-HPG, MMDA, and other concerned government agencies and stakeholders shall promulgate the Implementing Rules and Regulations of this Act within 6 months from the effectivity of this Act. Mandatory compliance though shall be enforced only one year after the effectivity of the IRR. 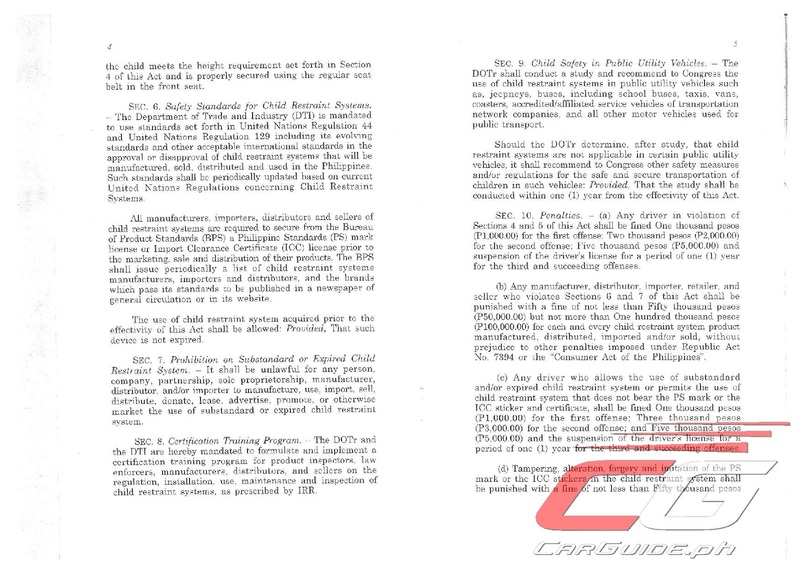 For drivers not transporting a child using the proper CRS, they’ll be fined P 1,000 for the first, P 2,000 for the second, and P 5,000 for the third and succeeding offenses. It’s worth noting that for the third offense onwards, it will also mean a suspension of the driver’s license. The same fine goes for drivers using substandard/expired CRSes. For manufacturers, distributors, or sellers bringing in substandard CRSes, they’ll be fined anywhere between P 50,000 to P 100,000 for every illegal CRS product. Any tampering, alteration, imitation, or forgery for CRSes will also be met with the same fines. Oh, and remember: it’s unlawful to use, import, sell, distribute, donate, advertise, promote, or make the use of substandard and expired Child Restraint Systems.